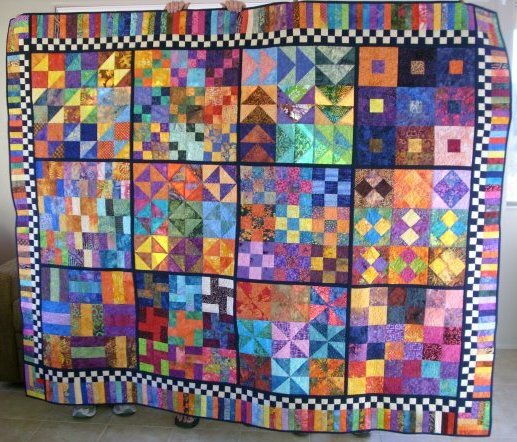 I haven't been doing much quilting lately, except to make my 9 blocks to trade next month and put the border on my current bee block. Miss Em has been home on spring break and I've enjoyed spending time with her, even if she beat me at bowling yesterday. Well, we each won a game and decided to call it quits when we were both ahead. She left this evening and probably won't be home again until the end of the semester in May. I miss her already. Yesterday was also my birthday. In addition to bowling, Miss Em and I had lunch together, then Mr. T joined us for dinner at my favorite seafood restaurant. One should not have to cook on one's birthday! Miss Em surprised me by telling me she wanted a car trash bag like one I had pinned on Pinterest. So, today before she left, I made her one. I made it just like the tutorial, but had to shorten the strap considerably. It's sitting on the front seat in the first picture and hanging from her emergency brake in the bottom pic. I liked how well it turned out and how dead easy it was, so I decided to make one for myself, too! Mine is smaller and not quite so deep, but it fits my car perfectly, hanging from the gearshift. Now I'll have somewhere to put that trash besides on the passenger seat. A small group I belong to is doing a monthly block exchange. Each of the 9 of us makes 9 of the same block, all in batiks. Then at our monthly meeting, we each get one of each of the other's blocks. It's taken us several months to figure out how to actually do the exchange without getting confused, so that everyone ends up with 9 different blocks. Someone usually accidentally takes two, or misses one, so that it doesn't come out even in the end. We finally just pass each stack around the table, each person taking a block until they are all gone, then pass the next stack. This month's exchange went perfectly -- except we had an absent member, so someone had to collect for her and she will have to bring her blocks next time. I did the same block swap a couple of years ago with an online group, but that one is still a WIP. 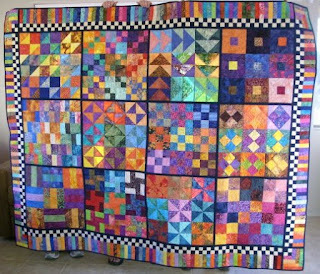 :) All the blocks are together, but I haven't sashed them and then there's that border! I've got the black and white checkerboard sewn on the piano keys, but I still need to assemble it all. Sounds like a good retreat project! 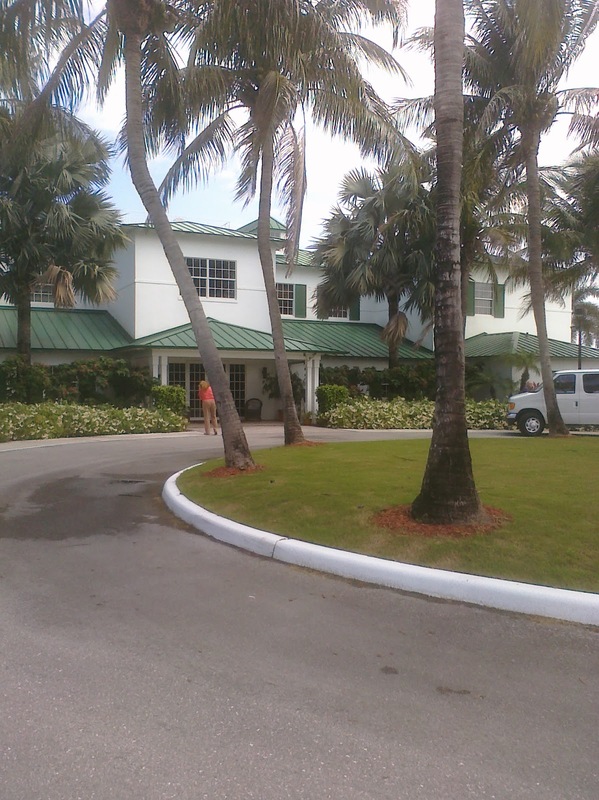 I'm spending some time with a long-time friend in Boca Raton, FL this week. I brought my Farmer's Market hexies and stitch when I have a chance. 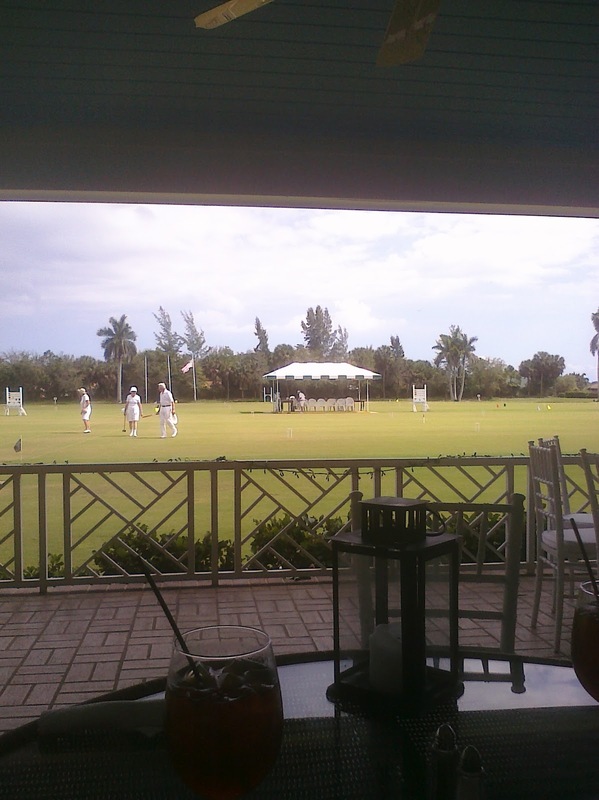 But the most fun today was a visit with another friend who took us to lunch at the National Croquet Center in West Palm Beach. 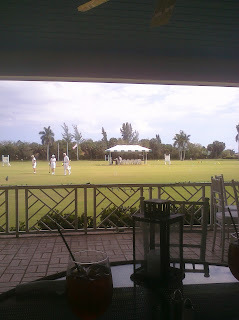 We ate a yummy lunch on the verandah overlooking the manicured lawns with white-clad players knocking croquet balls around. Who knew?? The pics were taken with my cell phone, so they aren't the best. But trust me, it was beautiful!